Last week on my other blog I wrote about the inspiring Sheila a.k.a. 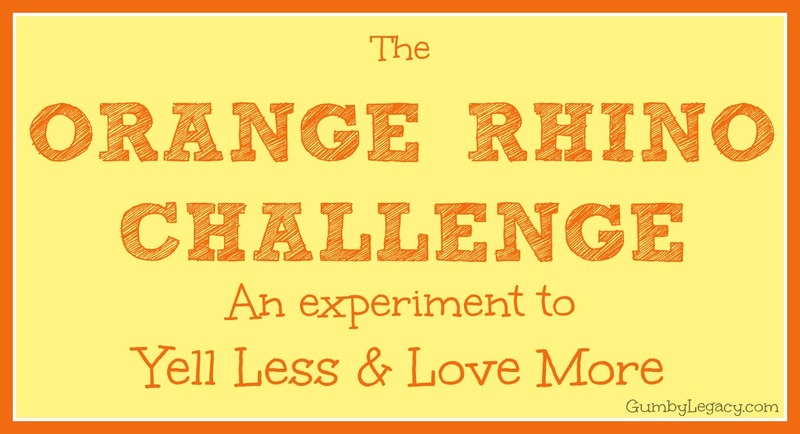 The Orange Rhino and her book club I’m doing this month to Yell Less, Love More . I thought originally that I’d put my Orange Rhino Challenge experiment in the parenting section on Tummy Time & Beyond which is all about how What parents know and do, shapes how their babies learn and grow. But the more I think about it, the more I realise that my anger issues and therefore the reason I am yelling so much is because I’m still so angry in my grief. Anger is not a pleasant emotion and it’s one that doesn’t sit well with me at all although it’s never far away these days. It’s also a well-known ‘Brooke’ characteristic with both Gumby and our dad having tempers that were not often lost but when they were, things could get pretty fiery. I think that in some way, me dealing with my anger issues can be related to both living life and accepting death so I shall share them here from now and hope that my story might in some way be of help to someone else. You can read the intro to this challenge here. Amazingly, I had a breakthrough last night with my ‘big baby’. She’s 4 next week and last night something happened where the little baby really annoyed her and she ended up hitting her and getting really aggressive. This is obviously very unacceptable behaviour so I picked her up calmly and took her upstairs. She was screaming and upset but I managed to get through with chatting and a bit of comedy effect role play. We acted out what the baby had done to upset her and talked about ways she could react instead (ask the baby to stop nicely or call me for help). A bit of a laugh, big cuddles, a future plan and NO yelling! We haven’t started the full no yelling part of the challenge yet but this week has been all about noticing triggers and becoming more aware of the physical signs that happen before we lose the plot and let out a yell. In this chapter of the book, you’re encouraged to dig deep and really question why you are getting so angry that you take it out on your kids. Is it really because of what your children are (or are not) doing or is it more to do with you and what’s going on in your head? More to do with the fact that you’re annoyed because you overslept and are running late with leaving for school? Angry after an argument with your partner and taking it out on your kids? Worried and distracted because you’re running up to a deadline at work so you’re not focusing and listening to your children’s needs? Yes, it’s true. I take out my bad mood and frustrations for the things going on in my head on my kids but I know that with awareness, alternative positive strategies and support from the Orange Rhino ‘fan club’, I will be able to manage these stresses in a much better way. Things are already feeling more loving in our household. Yay! The fun bit for this week was buying orange nail polish and painting my nails as a reminder of my decision to be an Orange Rhino! If you want to learn more about the book, here’s a link to check it out on amazon. This is an affiliate link so if you buy it after clicking the link, we will get a tiny commission which costs you nothing extra but helps us out a load!